Carat- This is the one that most people know because people know that diamonds come in carats. Many people might believe that a carat is a way to measure a diamond, but actually, it is a unit of weight. The higher the carat, the heavier (and more expensive) the diamond. In fact, the carat is one of the largest factors that determine cost of the loose diamond, but may be something you can adjust if your budget is smaller. For example, the difference between a 1.3 and 1.4 carat diamond may not be seen by the human eye. Instead, it may require highly magnified equipment that you will not have access to, nor will your significant other. The price difference between a 1.3 and 1.4 carat diamond, however, may be thousands of dollars. This is where you should think about price versus status. If it is worth the extra money to you and your fiancé to say the diamond engagement ring is 1.4 carats as opposed to 1.3 carats, then it will help you to make your decision. Color- In the world of diamonds, even though there are many different beautiful colors, the colorless or “white” diamond reigns supreme. When diamonds are graded for color, they are given a letter grade. A D-grade diamond means it is completely colorless and also the most expensive color diamond money can buy. 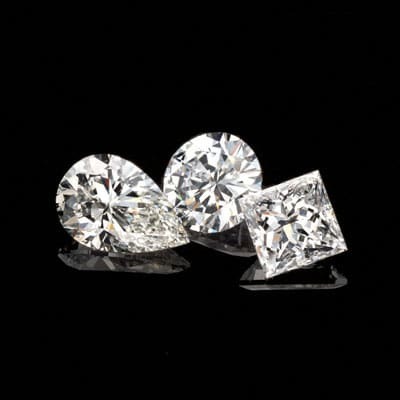 Moving down the alphabet, G through J grade diamonds will appear colorless to the naked eye and are still considerably pricey. The closer a diamond gets to a Z-letter grade, the more visibly yellow or brown the diamond will appear to the naked eye, which can be perceived as dirty. Clarity- The clarity of a diamond refers to its “perfection” which is more a saying than anything else because naturally occurring diamonds are rarely perfect. The grading scale for diamond clarity goes from F for flawless (which is rare and extremely expensive) all the way down to I 1,2 and 3, meaning there are heavily included flaws. Heavily included flaws are not recommended. Instead try going up a level to S (slightly included) and look for a diamond that looks beautiful to the naked eye, despite the fact that there might be some tiny flaws within the diamond that can only be seen with special equipment. This is a way to save money. Cut- Cut is perhaps the most important of the Cs when it comes to how a diamond looks because diamond cutters work to make a diamond look as beautiful as it possibly can. Some diamonds are cut in order to hide flaws. Others are cut to ensure the diamond is a high carat. Others, still focus on overall brilliance. When you work with specialists at The Diamond Reserve, start by looking for diamonds that catch your eye because of beauty and you can’t go wrong.